I’ve received some welcome attention from media lately, mostly because of my holiday letter, which acknowledged my terminal cancer. Daniel Finney, a longtime friend who’s a Des Moines Register columnist, wrote his Christmas Day column about Mimi and me, after interviewing us both. Another old friend, Paul Stevens, noted the Finney piece in his Connecting newsletter, which prompted some praise in a subsequent edition of Connecting from John Lumpkin, yet another old friend. Next came an interview Tuesday evening with Jim Engster on the Louisiana Radio Network. Also Tuesday, Current published a story I wrote about journalism ethics and community involvement. Update: Sunday, Jan. Matt Hansen’s column in the Omaha World-Herald was about Mimi (and men who command women they don’t even know to “Smile!”). But I got a mention. 2016 has been an outstanding year for Mimi and me. We’ve had our disappointments, and they may be our biggest news of the year. We’ll get to them in due time. Madeline and Julia enjoyed an Easter egg hunt in our home. 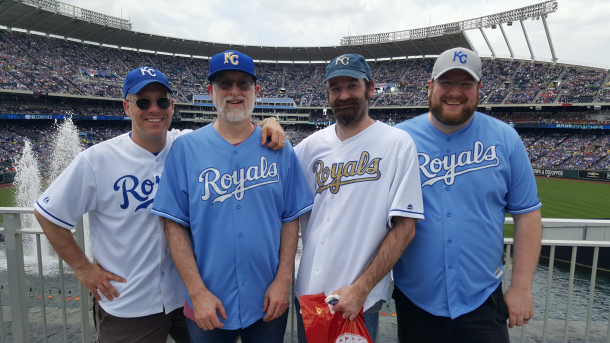 Mike, left, me, Joe and Tom at Kaufmann Stadium in June. We had more than 10 visits with one, two or all three of our sons. The boys and I met in Kansas City for a weekend of baseball and barbecue in June (and I managed to see both of my brothers, Mom and some friends on that trip). Mimi and I went to Washington for Thanksgiving with Tom and Ashley, with Joe and Kim joining the fun again from Vegas. And earlier in November, Tom and Ashley came down to Lexington, Va., to join me for a weekend with niece Kate and Mark Prylow and their children, when I was speaking at Washington and Lee University. Plus we had solo visits (including Joe and Kim surprising me with a visit in Baton Rouge for my birthday and Mike taking me to my first New Orleans Saints game). We had more family visits this year, too: Mimi visited her sister, Carol, in Jacksonville, Fla., and my brother, Dan, visited us last week in Baton Rouge. My travels (more on that later) allowed me to squeeze in dinners with three of Mimi’s siblings and others family members in Iowa, Florida and Ohio. And more family visits are coming in January: my sister, Carol, and her family, and all four of Mimi’s siblings with their spouses. Professionally, this was a wonderful year for me. The Online News Association surprised me at its awards dinner in Denver with the Rich Jaroslovsky Founder Award. Friend Jim Brady (who was in on the surprise) was waiting at the next table and caught the moment on video. If you want to watch me blubbering my ­gratitude, go to the 50-minute mark on the video of the Online Journalism Awards. I’ll repeat more succinctly here my profound thanks to the ONA board for this career highlight. In reading about the award later, I learned that my friend Dori Maynard won the award posthumously in 2015. I am delighted to have my name associated with Dori’s and Rich’s in this way. And just last week, I learned of another honor: I will receive the Chairman’s Citation at the National Press Foundation awards dinner in February in Washington. Chairman Kevin Goldberg chose me for the award. Again, I am deeply grateful, both for the award and for the kind praise from many after it was announced. Another professional delight­ came in feedback from a source about a story I wrote in 1996. The source, Bridget Hegarty, actually provided the feedback in 2015, through a Facebook message on Christmas Eve, when I was still hospitalized, recovering from my stem-cell transplant. She told me that my story “helped give what happened to me a voice. It was a voice that I can now use, and do use every day of my life. You gave my voice confidence and reassurance when I thought that part of me was gone forever.” That was as strong an affirmation of my work as a journalist as I have ever received from a source. I include it in the 2016 highlights because I went back to Omaha in February for a follow-up interview and wrote a story about the experience for the Columbia Journalism Review. And Bridget gave me a shout-out last week at her graduation from nursing school. The blanket Patricia Maris gave me. Another touching experience relating to feedback on my writing came in October, when I received a gift from Pat Maris, the widow of Roger Maris. I have written repeatedly for years about why Maris belongs in the Baseball Hall of Fame. And this fall, I learned that a grandson of Maris is in a colleague’s writing class at LSU. I shared some links to my blog posts with the grandson, and he shared them with his grandmother. And she sent me a blanket from Maris’ celebrity golf tournament. Of course, I blogged about it. Still another highlight of the year was when Brian Duffy, my former Des Moines Register colleague and favorite editorial cartoonist, drew me for my birthday, based on my Heisenberg Twitter avatar. It has become my social media avatar and the original hangs on our dining room wall. I didn’t blog as much as usual this year, because I’ve been writing letters to our sons. But my post on the newspaper industry’s defensive digital strategy created a bit of a ripple, drawing attention from the Poynter Institute, Carrie Brown-Smith, Guy Lucas, Dan Kennedy, Dan Rowinski, Tom Grubisch, Lee Procida and lots of journalists on social media. I wrote a few other posts of note during the year, wondering for The Hill about Hillary Clinton’s birthday wish list (we share a birthday) and sharing tips for localizing national and world news for the National Press Foundation. One of my favorite writing projects for the year was a LifePost timeline about my father, Luke Buttry, who died in 1978. The project was an effort to share Dad’s story with the many grandchildren who have no memories of him (and provide a refresher for those of us with fond memories). My great-nephew (and Dad’s great-grandson) Keaton Poulter died in February at age 7, and I memorialized his short life in a Lifepost, too. Mimi had a productive year in writing and with the needle. She got a good freelance gig for much of the year, writing questions for the weekly news quiz that was part of Reuters’ White House Run app. She also continued the needlepoint hobby that helped her get through a trying 2015. Her “Expert sailors aren’t made on calm seas” hangs above my desk. 2016 was a good year at LSU’s Student Media, too. Student initiatives helped lead us further and faster toward a digital-first operation than I could possibly have led our students on my own. Students proposed combining our print, TV and digital operations into a single newsroom this fall and switching from a daily newspaper to a 32-page weekly, with a ramped-up digital newsroom, in the coming spring semester. The students are making great progress and plans, and we’re excited about the spring semester. I also collaborated in the planning and presentation of Just the Facts, an American Press Institute fact-checking boot camp at LSU. In a year when facts seemed to matter so little in the presidential election, I was pleased to be swimming against the tide, exhorting journalists to check the facts and call BS on politicians and others in power. And, as an old API hand, I enjoyed collaborating with the current version of that important organization. Chemotherapy curtailed all of my travel in 2015, except for Tom’s wedding and some Louisiana day trips. But I was free to travel extensively in 2016, free from chemo for part of the year and later taking chemo that didn’t make me as vulnerable to infections as my 2015 drugs. So I traveled. I was a keynote speaker at the Future of Student Media Summit at Ohio University in April and an ethics fellow at the 62nd Journalism Ethics Institute at Washington and Lee University in November. I spoke on panels or simply attended journalism conferences in New Orleans, Gainesville, Fla., Oklahoma City, Philadelphia and Minneapolis, in addition to ONA. I returned to TCU, my alma mater, in a faculty exchange with Steve Myers, who spoke at LSU. I flew to St. Petersburg, Fla., to lead a day of workshops for The Penny Hoarder. A great benefit of the travel was that I had breakfast, lunch, dinner, drinks or just hallway conversations with dozens, if not hundreds, of new and old friends at the various conferences and other travels. I won’t try to name you all here (because of the certainties that I’d overlook some and that I’d bore everyone not listed). But those conversations and hugs raised my spirits again and again throughout the year. I am more grateful than I can say for my many friends and the support you have provided. A year packed with that much joy is a terrific year, even if some heartbreak came along, too. My two visits of the year to Mom in Kansas City were difficult. Alzheimer’s has taken not only her memory, but most of her awareness of life around her. When I visited in February, she didn’t even know I was family. Four visits over two days in June showed her in a different mental state each time, never recognizing me but a couple of times understanding that family members were visiting. She still enjoys music, even if she can no longer sing lyrics. One special moment of recognition involving my brother Don showed us that occasionally some understanding cuts through her mental fog. My older brother, Dan, visited in December for her 90th birthday and reports that on a few occasions she seemed to understand and appreciate that her Cubs finally won the World Series this year. Again, cancer brought the year’s greatest heartbreaks. Mimi and I enjoyed dinner in Denver with Meg and Dave. We wept over the breast cancer diagnosis of our niece and goddaughter, Meg Winter. Mimi and I were honored to preside at Meg’s wedding to Dave Winter in Colorado in 2012. Her diagnosis came shortly before ONA this year, so we were able to share hugs and dinner in Denver in September. Meg is enduring the ups and downs of chemo now, and we wish we could be there to continue supporting her in person. And, as you may know, I had another major cancer diagnosis myself in July. This pancreatic cancer is unrelated to either of my earlier major cancers, colon cancer in 1999 and mantle-cell lymphoma in 2014-15. An edited version of my blog post about Cancer 3.0 ran on the health-care site STAT. After a few months of chemotherapy, we learned in November that the tumor is chemo-resistant. It’s growing and has spread to my liver. When I decided to stop treatment, my friend, Matt DeRienzo wrote a nice post about the Tao of Steve Buttry. I’ve been honored by lots of kind comments from friends, family and other journalists throughout my struggles with these diseases. Cancer treatment (and the end of treatment) are tougher on a spouse than on a patient, and Mimi has been a powerful source of support and comfort through this all. Whatever lies ahead, we’re facing it together and I have the help I need. We’ve exhausted the treatment possibilities, so now I’ll just enjoy as much life as I have left, savoring every day, even the tough ones. Because I’ve seen this year that a lot of wonderful things happen even in tough times. Twenty-five years ago, I crowdsourced the Minot Daily News’ coverage of the 50th anniversary of the attack on Pearl Harbor. I didn’t call it crowdsourcing. That word was not in the journalism vocabulary back then. Neither was “community engagement.” But I knew that the community had good stories to tell, so I invited readers to tell their stories. Most wrote with memories of where they were when they heard the tragic and historic news of the Japanese attack on U.S. naval forces in Hawaii. A few wrote of being in the military at the time and scrambling to full alert, in case other military bases were attacked. I didn’t save the coverage, but I think I recall correctly that we wrote stories on the two or three stories of local veterans who responded with first-hand accounts from Pearl Harbor. Maybe community engagement isn’t part of some magical solution to the economic woes of the news business (though I am certain it has economic value). But it was good journalism in 1991, when the 50th anniversary of Pearl Harbor was huge news. And it remains good journalism in 2016, when the 75th anniversary is noted with less fanfare. Cancer update: I informed followers of my CaringBridge journal Monday that I am finished with treatment for my pancreatic cancer. There are no current clinical trials for my kind of cancer that has spread to the liver, and no successful treatments once it’s in the liver. So I’ve stopped treatment and will try to enjoy whatever time remains. I am teaching a class at Washington and Lee University today on news literacy. I have been privileged this weekend to be an Ethics Fellow at the 62nd Journalism Institute at Washington and Lee University. The case study I will present to students today will deal with the plagiarism case of Fareed Zakaria, which I blogged about considerably in 2014. In presenting the case to the students, I will not tell his name or the names of the journalism organizations he worked for, but will just present some of the facts of the case. Then the students will discuss what they would do if they were in charge of one of those journalism organizations. After they discuss for a while, I will fill them in on the rest of the details of his case. Here’s a piece Andrew Beaujon wrote for The Washingtonian about how Zakaria paid virtually no price for his plagiarism.